Knouse Foods, owners of the Musselman’s brand, is one of the world’s largest apple processors. In January 2008, Knouse Foods approached Innovation Focus to develop a portfolio of products for their new product pipeline that included products targeted specifically at the Boomer generation. The challenge was how to update their classic products to reconnect with Boomers and meet their changing needs. We conducted in-home interviews with Boomers who ate apple sauce on a regular basis, and coupled them with secondary research on the Boomer demographic. We found that Boomers were looking for more unique and exotic flavors from their foods to satisfy their sophisticating palate. Our research also showed that fortified products are popular among Boomers because of growing concerns over their health as they age. These 2 opportunity areas, along with 7 others, fueled our ideation session. Participants generated ways to use classic Knouse products to give the Boomers exciting and interesting taste options and help them be healthier through fortification. 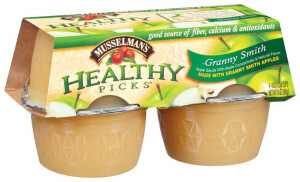 Musselman’s Healthy Picks marries two concepts from our ideation session into one Boomer-friendly option. Making its debut on shelves in March 2009, Healthy Picks is fortified with fiber, vitamin c, calcium and antioxidants. The fortifications are paired with exotic flavors such as Key Lime Cupuacu, Blueberry Pomegranate and Raspberry Acai to give Boomers a stimulating taste along with the supplements they need delivered through the classic food of apple sauce.